Will Abbas be Followed by Dahlan or Barghouti? Palestinians Criticize Abbas for Public Fatah Feud at Delicate Time Diplomatically. This is not an innocent story. It is a Times hasbara presentation that pretends to be “about” criticism by Palestinians of their president for starting a “feud” with Muhammad Dahlan. Some of Mr. Abbas’s current difficulties are of his own making. Palestinians say they are baffled by Mr. Abbas’s decision to open up another front within his own Fatah movement by beginning a nasty, public campaign against a onetime ally who Mr. Abbas now sees as a rival, Muhammad Dahlan, a former Gaza strongman and Fatah security chief. In the two weeks since Mr. Abbas’s opening salvo against Mr. Dahlan, who is living abroad, the Arabic media has been filled with unproved accusations by Mr. Abbas about the long-ago killings of prominent Palestinians, and by both men about collaboration with Israel and financial corruption. Mr. Abbas even implied that Mr. Dahlan might have had a hand in the mysterious death of Yasir Arafat, the father of the Palestinian cause, in 2004. For the most part, the two camps have not offered detailed responses to all the accusations. It makes more sense, based on what is in the story, to conclude that the Times is informing its readers that when the peace talks fail, as they most certainly will, the blame will fall on the “inept” leadership of President Abbas. The story further carries the hidden message that just maybe Israel, and the Times, want President Abbas replaced by Muhammed Dahlan. They figure it is time for a leader friendly to the Israel/U.S. imperium to take command of the Palestinian Authority. Abbas tried hard, but he just did not turn out to be the loyal strong man the imperium wanted. Isabel Kershner, who wrote the Times story, describes Abbas’ political fight with Dahlan as a “feud” inside Fatah, a feud the Times would have its readers believe is unwise because it comes during a “delicate time” in the peace negotiations. Kershner, painting Abbas with pejorative language, sees the “feud” as “a nasty, public campaign against a onetime ally who Mr. Abbas now sees as a rival”. Abbas now sees Dahlan “as a rival”? Dahlan has been a rival since at least 2003. The picture above was taken in 2003. 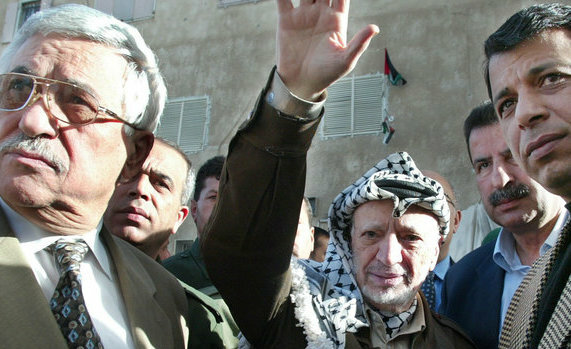 It shows Abbas at left, Arafat, arm raised, in the middle, and Dahlan at right, greeting the public. In 2008, David Rose wrote an article in the April issue of Vanity Fair, entitled The Gaza Bombshell. After failing to anticipate Hamas’s victory over Fatah in the 2006 Palestinian election, the White House cooked up yet another scandalously covert and self-defeating Middle East debacle: part Iran-contra, part Bay of Pigs. With confidential documents, corroborated by outraged former and current U.S. officials, the author reveals how President Bush, Condoleezza Rice, and Deputy National-Security Adviser Elliott Abrams backed an armed force under Fatah strongman Muhammad Dahlan, touching off a bloody civil war in Gaza and leaving Hamas stronger than ever. The New York Times chose not to remind its readers that Dahlan is far more than an Abbas political rival. He is a former Fatah leader who was ousted from the party by Abbas. In 2007, he was the U.S./Israel imperium’s chosen Fatah operative assigned to punish Hamas for winning a free and open democratic 2006 election, which Hamas won not just in Gaza, but throughout the Occupied Territories. “Those words were written by the Fatah warlord Mohammed Dahlan, whose US- and Israeli-backed forces were routed by Hamas in the Gaza Strip last month, in a 13 July 2003 letter to then Israeli defense minister Shaul Mofaz and published on Hamas’ website on 4 July this year. Dahlan, who despite his failure to hold Gaza, remains a senior advisor to Palestinian Authority chairman Mahmoud Abbas, outlines his conspiracy to overthrow Arafat, destroy Palestinian institutions and replace them with a quisling leadership subservient to Israel. In 2014 the New York Times has this view of Dahlan: “Mr. Dahlan, 52, rose from humble beginnings in a Gaza refugee camp to become a powerful figure in the Palestinian Authority who earned the trust of Israel and the United States. Some saw him as a potential successor to Mr. Abbas”. To President Bush, strongman Mohammed Dahlan is “our guy”. It is with good reason that President Abbas is insisting that one of the conditions for the PA to remain in peace discussions after the late April deadline is the release of more senior Palestinian prisoners. 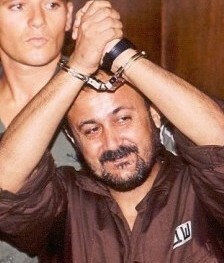 Among the prisoners he specifically names is Marwan Barghouti, (shown here in a 2002 court appearance) considered by many as President Abbas’ preferred successor. The 2003 picture at the top, is by Jamal Aruri/Agence France-Presse. It appeared in the New York Times. The picture of Marwan Barghouti is from Flash 80. It appeared in The Times of Israel. 5 Responses to Will Abbas be Followed by Dahlan or Barghouti? Jim, Thank you for raising this very important issue. Israeli policy has been to extract every pound of concessions from patriotic, moderate Palestinian leaders, until they drain them dry. Then they move to the next potential victim in line. Arafat was the first Palestinian leader to recognize “Israel” and he did so before receiving a reciprocal recognition of a Palestinian State, by Israel. He agreed to give up 78% of Palestine and be content with 22% of Palestine, namely, East Jerusalem, West Bank, and Gaza. And Arafat was the only Palestinian patriot who could do so because of his proven loyalty to the cause and bringing the Palestinian cause to “Statehood”. After all, he was “the father of Palestinian”. It is quite likely that Arafat was poisoned by Israeli agents, because they could not extract any more from him. Next, patriot Mahmoud Abbas enters stage. Abbas has, personally succumbed to Israel’s demand against allowing the return of Palestinian refugees to Palestine-Israel ’48. He has tentatively agreed to land swaps that make a mockery of the pre-June, 1967 borders. He failed to stop Israel’s continued settlement building and continued arrival of terrorist American-Russian colonial settlers. He has agreed to the charade of peace talks, combined with relentless Israeli settlement expansion, rather than bring Israel to The World Court for multiple crimes, including illegal occupation, ethnic cleansing, annexation, and apartheid, to name a few. So, now, Israel and US want to bring in Dahlan for the milking. They figure they can get him to go beyond what Abbas has already succumbed to, namely, the recognition of Israel “as a Jewish State” and, who knows, perhaps calling Jordan, “Palestine”? They also have super patriot, Marwan Barghouti, up their sleeve. He was held in Israeli prison for many years, now, I wonder what physical- psychological crimes they have committed against this steadfast Palestinian? His turn will surely come. The mind-mutilating Israeli terrorist psychiatrists and psychologist are surely preparing the grounds so he will one day emerge from prison, as the Palestinian Mandela. He will make the stage appearance as a “Savior” of Palestinian freedom, but he would be psychologically, mentally, and physically deformed, in preparation for the next “milking” stage. I have no doubt that all the Palestinian figures above are patriots and they have given their lives for the cause, but they are illiterate, when it comes to the combination of sophisticated Israeli-US gamesmanship. It is time for Palestinian leadership to say enough is enough, and make a B-Line for La Hague. Otherwise, they will remain in La-La Land. The new York Times has always pushed Israeli popaganda. It is a heavily pro Israel paper, staffed with many ardent zionists and Israeli Firsters. This is one reason Americans are so ill informed. Israel has no interest in a settlement, with the Palestinians, otherwise they would not be building these massive settlements, and demolishing non Jewish homes all the time, and in the middle of peace talks as well. The fact is that Israelis speak “with fork tongue” and have been deceitful in their claims of wanting a deal. They don’t. They have all of Palestine in an apartheid state, and have no intention of giving Palestinians equal rights under the law. They kill all opposition and even non violent protesters, and the world does not put them on sanctions. Israel annexed the Golan Heights and East Jerusalem, and the world just yawned. Look at the contrast between how the US is dealing with Russia over Crimea, when the Crimea was Russian for centuries, and the Golan Heights was part of Syria for millennium when Israel annexed it. The double standard is laughable. As long as money calls the shots in the US political system, the Israel Firsters in this country will control our congress and government policies as they have for decades regarding the middle east. We have a saying in Arabic, “if you do not want to knead the dough, you keep sifting the flour” and Israel has been sifting the flour for more than 20 years. If it were interested in peace, it could have been achieved. Unfortunately they have been using Palestinian leaders as pawns on a chess board and they move them as they please. It is very sad that after all the compromises both Arafat and Abbas made for the sake of peace, the Palestinians ended up with neither the land nor peace. Yes indeed the Palestinians feel ashamed that this internal feud could take so much of the energy of the leadership, as if it was not bad enough to have the split between Fateh and Hamas at a time when the whole world is allowing Israel to get away with all its annexation, building of settlements and violations of human rights. It’s hard to imagine a PA leader more acquiescent to Israel and the U.S. than Abbas. Jim, you have once again outdone yourself and triggered these several on-point observations. Thank you, sir!